When Charlie was born, I knew in my heart there was something wrong, he didn’t look normal and didn’t make a noise. When he was three weeks old he went back into hospital as he had a nasty chest infection and he kept having these grey episodes which seemed to happen when he was having his milk. I now know what it was – his little body was working so hard trying to co-ordinate things, drinking his milk and breathing. He wasn’t getting enough oxygen while he tried to feed. He’s undergone so many invasive tests and a range of genetic tests. Next he is having a muscle biopsy. Doctors are yet to make a diagnosis but for now, at just one, he is fed through a nasal tube, he is slowly building up his muscles and he can now hold his head up and is starting to move. In October last year when he was three months old, my GP put us in touch with a neuro consultant who agreed that we had reason for concern. She sent him for an x-ray and when they put an oxygen probe on him, they saw he was not taking in enough oxygen. He was rushed away, which was awful, and he spent the next five months in hospital. I stayed with him as he was my priority despite the fact that I had Louis, his twin brother and Jacob, my six year old at home. I had to be with Charlie. 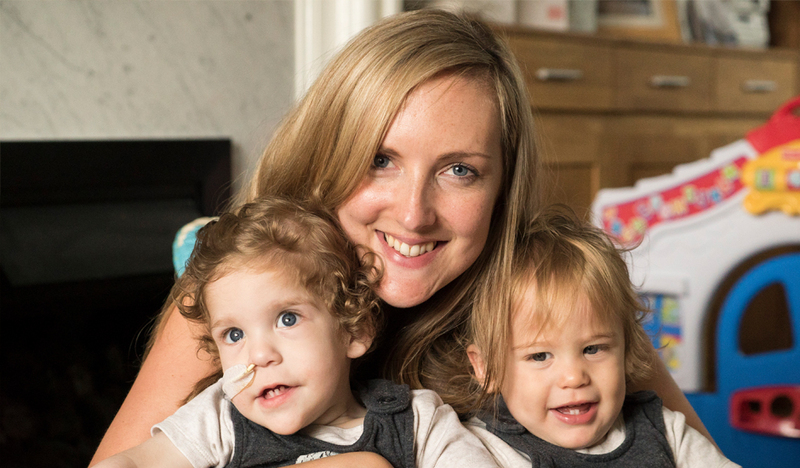 I felt so guilty for Jacob – not only had two new babies arrived but I was in and out of hospital with Charlie. Jacob had had us all to himself for the past five years and now his whole world was being tipped upside down. Just before we were discharged from hospital in February this year, our Community Nurse recommended Rainbow Trust. I knew we’d need as much help as possible when we went home so I agreed. Dawn, one of Rainbow Trust’s Southampton Family Support Workers, came to see us and did an assessment. She visited us three times a week, which took that pressure off of me just having someone else there to help. She’s like having a big sister, she just slots in – I don’t feel like she’s a visitor, she just gets on with it and I trust her, I trust her with my children and especially Charlie who has such special needs. Dawn spends time with Jacob giving him one to one time so that he feels special again. She’s also taken him for days out with other children, which has been great for him. He really enjoyed that. Jacob can talk to Dawn about anything that’s bothering him and he knows that she is there for him. That makes such a huge difference to me – it’s been hard for him. When I was rushing around doing things, he told me, “Mummy you don’t listen to me anymore,” and he’s got a valid point. Unfortunately, I can’t always listen to him so having Dawn means he has someone special who does listen to him. She’s been amazing, things would have been so much harder without her. Now that we have Charlie in a routine and he’s a bit more solid, Dawn helps out in the early evening for bath time. She plays with Jacob and Louis while I bath Charlie or gets dinner ready for one of them. It’s usually such a stressful time but I want them to enjoy bath time so having Dawn to help makes a huge difference. She also helps out when I have hospital appointments with Charlie. She’ll collect Jacob from school and look after him and Louis so I don’t have to worry about entertaining three children while I speak to doctors about Charlie. I’ve also been offered some hydra therapy time so Dawn is going to help by taking Charlie. I know she’d want him to have that time as he’d love it. I work Wednesdays so my mum has the other two boys. Looking ahead, Charlie’s prognosis is good. He is yet to be diagnosed but for now, he is doing really well. He still has recurrent hospital admissions due to his chest infections and respiratory difficulties and we still have to carry an oxygen and suction machine around with us but on the whole, he is doing really well. I am really excited about Christmas this year, the idea of having us all together is magical for me. We are going to make a big thing of it as last year just didn’t feel like Christmas. But this year will be special, having all three boys with us at home. Dawn’s help is like a lifeline, just having someone else to turn to, to talk to and to help with all the little things makes a huge difference to my family. I’d definitely recommend Rainbow Trust to other people in a similar situation, I trust Dawn with my family and I wouldn’t want to be without her.